Last year, 12-year-old Ethan Arbelo earned his Eagle, Globe, and Anchor when he was made an Honorary Marine, joining a group of fewer than 100 who have received that title. Last week, Ethan’s family said he had earned his angel’s wings. Diagnosed with Anaplastic Astrocytoma Grade III, an aggressive brain cancer, in Feb. 2012, Ethan embarked on a mission to make the most of the time he had. His mom, Maria Maldonado Arbelo, herself a Marine veteran, created “Ethan’s Bucket List,” a tally of her son’s dream adventures. With donor support raised in online fundraisers and through various charitable organizations, Ethan swam with dolphins at Sea World, took a trip to Disney World, and made a cross-country road trip. 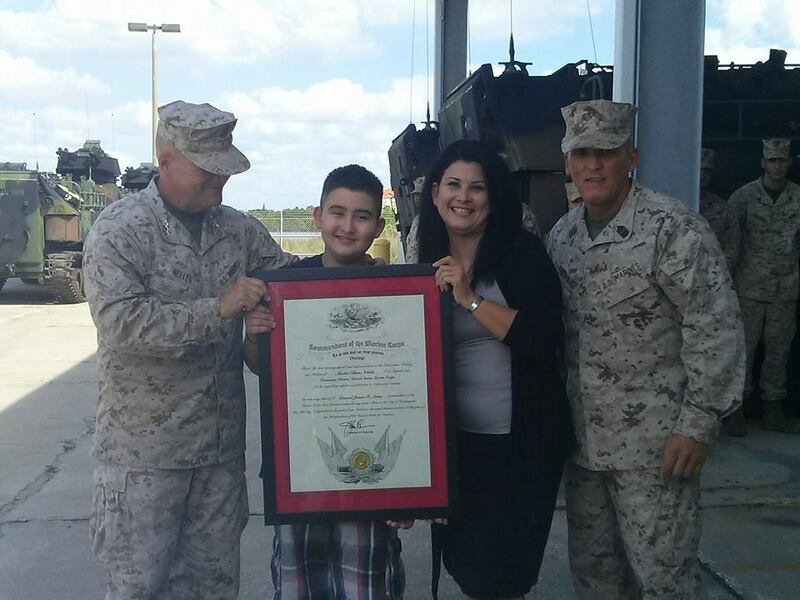 But one of the most memorable moments on the bucket list came Oct. 31, 2013 when Ethan visited the headquarters of 4th Marine Assault Amphibian Battalion in Tampa, Fla. to be made an honorary Marine. Presented by Lt. Gen. Robert Neller, the honor was not lost on the 12-year-old. During a rest break Thursday at the Marine reserve center near the foot of the Gandy Bridge, Master Sgt. Will Price tried to coach Ethan through some Marine swagger. The sergeant didn’t need to finish his instructions. “Once a Marine, always a Marine,” Ethan fired back. On July 3, Ethan’s loved ones posted tragic news to the Facebook page Ethan’s Journey. Since then, hundreds of well-wishers have posted on the page, including friends and family and members of the Marine Corps community. In the months preceding Ethan’s death, Maria Arbelo wrote that she had been overwhelmed by support during that difficult time. In the wake of Ethan’s death, there’s still an opportunity to help the family: they’ve launched another online fundraiser to help cover funeral expenses. My prayers and blessings. Semper Fi.. We are a big family and come together in times of need. Rest in Peace Little Bro… SEMPER FIIII You will be guided by the Angels to your new assignment in Heaven…. And when the Army or Navy looks on heaven scene they’ll see the streets are guarded by another US Marine. Semper Fi, Ethan. You will always be remembered and we will see you on the other side. I salute you. Semper Fi my little brother…rest in peace…. Semper Fi, May the grace and mercy of our Lord Jesus Christ be with your family. May you continue on with your courageous ways as a brave MARINE (honorary) and watch over our military on earth. God bless you. Rest in Peace, Semper Fi. Rest in Peace and prayers to your family and friends. You are a true hero, Ethan! The Corps has been made even stronger for your service. Semper fi. Rest in peace, young brother. Just read about my brother MARINE. Praying for your loved ones as well as yourself , he is no longer in pain and now directing the MARINES gone before him. Another Marine is guarding Heaven’s gates. Thank you for your service, Eman. You can rest easy now. To Eman’s Momma, from one WM to another, know that many hearts are with you. Your Marine touched many lives. Semper fi, my sister. Another Marine guarding the gates of Heaven!! Rest in peace and Semper Fidelis.